My fourth book, The Adventures of Dixie Dandelion is due to be released in November by The Wild Rose Press. Many of you know I’ve been working on Dixie for quite some time — four years to be exact. Dixie first popped into my head when I was writing my first book, Soldiers In the Mist. I had to put her on the back burner to finish Soldiers. 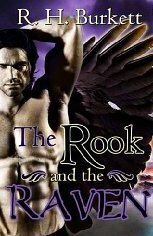 I returned to Dixie only to have my second book, a novella, The Rook and The Raven come in and take over. Dixie went to the back of the line again. I started again with her only to have Bethany Ann from my third book, Daughter of the Howling Moon, come roaring in with a vengeance. Alas, Dixie had to wait, yet again. For those of you who know Dixie, you can imagine just how happy she was. She refused to talk to me for awhile but finally her story came through. OMG. What a story! So just who is this Dixie Dandelion? Well, the love of her life, Pinkerton Detective Jackson McCullough describes her as passionate. “When life slaps her down, she jumps up, spits in its eye, and dares it to hit her again.” Railroad foreman, Big Mike Donovan says, “She be a stick of dynamite with a fuse of wild scarlet hair.” My friend, sister, and fellow author, Linda Apple claims there is a lot of me in Dixie. I think it’s the other way around. But either way, Linda is correct as I’m convinced I was Dixie Dandelion in the 1860’s. Dixie is a rootin,’ tootin’ cowgirl. She can ride and rope. Drink and smoke. Can’t shoot or cook worth a damn, however. She is well educated as her mother is a graduate of Wesleyan Female College of Macon, Georgia and insists on teaching her daughter how to conduct herself as a proper young lady at all times. Dixie’s Christian name is Margaret Katelyn O’Shea. Her mother is a Southern Belle China Doll complete with verandas, long frilly gowns, cotillion and money. Her Papa is a wild, Irish rover with flashing blue eyes, gut-busting laugher, a love for fast horses, and two bits in his pocket makes him a rich man. Unable to resist a good donnybrook, he rides away to join the War of Northern Aggression and never rides back. Dixie has her mother’s slim figure and beauty, but her father’s blue eyes, scarlet hair, and temperament. Dixie’s fraternal grandmother, Margaret has the gift of sight. A gift Dixie’s mother refuses to acknowledge or stand for claiming her mother-in-law is nothing but a Banshee Witch. While Dixie has never seen a ghost, she does hear the voice of her beloved Papa at times and often calls on his help when in danger, which is most of the time as Dixie’s middle name should’ve been trouble. 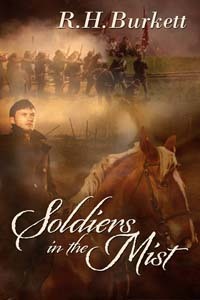 Through a series of events, Dixie finds herself alone on a wagon train. She stabs her step-father when he attacks her, steals a Pinkerton Detective’s horse, and rides to Six Shooter Siding where she is befriended by Peg Williams, a madam of The White Dove and her “soiled doves.” Dixie is fiercely independent and proud. Determined never to be “dependin’ on others,” her stubborn streak throws her into one mess after another much to the chagrin of Pinkerton Detective, Jackson McCullough who calls her his, wild, prairie dandelion, Dixie Belle. 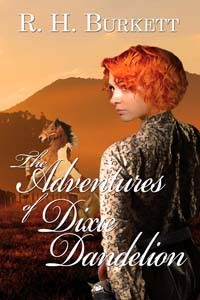 From stabbings, horse-stealing, lynching’s, shoot-outs, Indians, Chinese, The Mollie McGuire’s, and fast horses, The Adventures of Dixie Dandelion has it all. From start to finish Dixie is full of grit and fire. Hold on tight, you’re in for a hell of a ride. The Adventures of Dixie Dandelion coming November 2016 from R.H.Burkett and The Wild Rose Press. This entry was posted in Dixie Dandelion and tagged adventure, Irish, RH Burkett, Ruth Burkett Weeks, The Wild Rose Press, westerns. Bookmark the permalink. 2 Responses to Who is this Dixie Dandelion? Well, it’s about darn time! 😍 Can’t wait to read it!